Last September, in the Yuhua flat where she lives alone, widow Lina Teo, 63, slipped and fell while mopping the floor. The incident left her with a broken left wrist - and a sharp awareness of how things could have been worse. "If I fell and couldn't wake up... nobody would know," she says in Mandarin. But today, such an incident would be noticed - by her home itself. As part of the Housing Board's smart home pilot project in Yuhua, motion sensors have been placed outside the bathrooms in Madam Teo's flat. "A lot of old folk fall in the bathroom," she notes. If the sensors detect unusual inactivity - for instance, if she goes into the bathroom and does not emerge for an hour - her younger son will be alerted on his mobile phone. "My son likes it, he says it's useful. At least they know how things are with me at home," she says. This is a simple example of how a "smart home" can reduce stress and anxiety for elderly folk who are home alone, and for their family members. With the number of seniors living alone estimated to reach 83,000 by 2030, these monitoring systems could take a huge load off the minds of those who need to juggle work and family responsibilities. 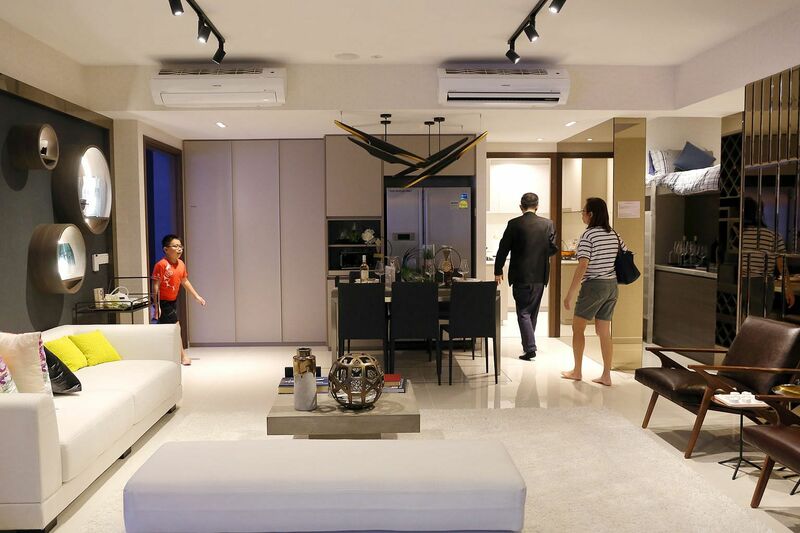 Mr Heru Santoso Soedarsono, deputy director of the Housing Board's Building Research Institute, says that when it comes to smart homes, the HDB's focus is very much on "practical things that meet residents' needs" rather than "all the sci-fi stuff". Ideally, smart homes and smart cities are designed around the people who live in them, and exploit big data and other advances in technology to reduce stress and waste while increasing choice and comfort. They should, in the words of urban design guru Carlo Ratti, have a "liberating effect". In the future city that Singapore experts envision, big data is not a disruptive force but a process of incremental, technology-enabled change that smooths the average citizen's day. Those who live in a smart city might find the temperature at home just right thanks to smart air-conditioning. As they head off to work, smartphone apps keep them updated on traffic conditions. If they take public transport, their walk to the bus stop or train station is shaded and breezy thanks to smart design. Such design may even extend to the facades of buildings shifting subtly each day to improve windflow and provide shade. The ability to program things, to know that things will be done at a certain time by the time I get home... The security of knowing who's going to be in my home... These things help to lessen my stress as a working mother. MS WENDY LAW, a human resources manager and mother of a young daughter. That last architectural flourish is suggested by Dr Heiko Aydt, a senior researcher at the Future Cities Laboratory here, who says the technology should be invisible. "This would be my vision of a truly smart city - I don't see all this technology, I don't get bothered by it... I might not actually realise it but life has become a lot more smoother." Ms Wendy Law, 39, and her "techie" husband love that their executive condominium (EC) in Sembawang, The Visionaire, comes with smart enhancements such as a washing machine with timer settings and a front door that can be locked and unlocked remotely. The human resources manager and mother of a young daughter says: "The ability to program things, to know that things will be done at a certain time by the time I get home... The security of knowing who's going to be in my home... These things help to lessen my stress as a working mother." In future, such homes could even come with a smart fridge that lets home owners see at a glance what groceries are running low, says Mr Li Jun, general manager of Qingjian Realty, the EC's developer. For $6,500 to $8,000, depending on unit type, buyers in this first "smart EC" get cameras, motion sensors, smart air-conditioning and more. Right now, though, consumer acceptance of smart home technology is relatively low, says Intraix co-founder Darrell Zhang. Unlike those in the United States or Japan, most home owners here are not willing to pay much for smart homes, he says. The tech firm is taking part in the HDB's Yuhua trial, in a consortium with a major telco. As well as the elderly monitoring system, the trial includes a utilities management system so residents can track utility use and, if they choose, adjust how much energy they consume. Intraix's KLUG Home device looks like a thumbdrive but is the brain of a smart home system, capable of connecting to energy meters, motion sensors and so on. They have also come up with KLUG Air, an air-conditioning control system that can learn usage patterns and improve on them. Together, these cost $200, a price Mr Zhang doubts Singaporeans will pay. So he is offering a subscription package where home owners pay $6 a month to monitor energy consumption, and he hopes more home owners will consider giving that a try. When public housing projects Northshore Residences I and II in Punggol are completed by 2020, Singaporeans will be able to experience the improvements that data and smart design bring to an estate. Planners used virtual models of wind flow, temperature, sunlight and shade to help them decide how to angle the 12 blocks, where to plant greenery and the best shaded spots to site playgrounds and fitness corners. The estate will come equipped with sensors to capture data such as temperature and humidity, which smart fans in places like the neighbourhood centre will use to adjust settings. Other sensors will track the use of lifts and lights, allowing potential problems to be spotted earlier. On the national scale, the Urban Redevelopment Authority is using digital tools to generate concept planning scenarios for testing. Concept planning is the process by which the URA draws up blueprints for the city state's development. A virtual 3D model of Singapore is also being built and, when ready, will be used by planners and architects to better visualise changes, such as how a new development will affect prized "view corridors" to waterfronts. These data-driven efforts are visible mainly to planners, but the hope is that the end result will be a more pleasant city for citizens. Indeed, this focus on the citizens is why the Future Cities Laboratory prefers to talk not about "smart cities" but "responsive cities", says Dr Aydt, who is the coordinator for that research group. "It basically puts the human back into the centre of attention, rather than technology." Singapore has already started becoming more responsive in small ways, says Dr Aydt, thanks to a multitude of traffic apps that keep commuters updated about driving routes and public transport times. These help people cut down their waiting and travel times. In the long run, big data could bring about larger changes in behaviour - or so Professor Gerhard Schmitt hopes. As principal investigator of big-data-informed urban design at the Future Cities Laboratory, he is working on the Cooler Calmer Singapore project. He estimates that the urban heat island effect here raises the temperature by an additional 4 to 7 deg C. Part of this is due to the built-up environment, but a lot of heat is generated by activities such as transport and electricity production, which can be changed. "If it's due to human activity, then that means we can change it," he says. The Cooler Calmer Singapore project is studying heat sources and running simulations on possible solutions. If Singapore's temperature can indeed be lowered, the impact would truly be islandwide - in every citizen's daily life. DOLLARS AND SENSE A cooler Singapore would also be more energy-efficient, which means cost savings. And efficiency in general is how the smart city might make business sense. "If through big data you make a city that operates more much smoothly with less congestion, of course that has a huge economic impact," says Associate Professor Patrick Janssen from the National University of Singapore's department of architecture. But, he adds, this is not something one can "sell" or to which a clear price tag can be attached. At the same time, "focusing on things like GDP and hard dollar figures is missing the point", says Dr Aydt, because the future city is really about liveability, which involves putting the citizen at the centre of things again. "I like to look at it in terms of how this can help to improve how pleasant or stressful life is. And this, I think, is difficult to quantify." Even the Government's Smart Nation Programme Office (SNPO), which oversees Singapore's smart city push, declines to put an overall dollar figure to the benefits. As SNPO head Tan Kok Yam sees it, there are two direct payoffs. First, futuristic tech is applied to overcome age-old constraints of land and manpower by improving productivity, land efficiency and resource management. Second, being part of the global digital revolution means the creation of high-value jobs and business opportunities for Singaporeans. But pressed for figures, Mr Tan simply says: "It is difficult to measure economic impact." One spillover effect might be the boost to Singapore's attractiveness as a global city. International rankings may not include a specific "smart city" criterion, but being a smart city improves performance in areas such as infrastructure, technological readiness and innovation - three of the criteria in the World Economic Forum's Global Competitiveness Report, for instance. Yet, ultimately, creating economic opportunities is just one of the initiative's three stated goals. The other two concern citizens' lives: improving the quality of everyday life, and forging stronger communities. For the SNPO, "smartness" is not about how advanced or complex technology is, but "how well a city uses technology to solve its problems and address challenges", says Mr Tan. "A smart city must use technology in ways that make a positive impact in the lives of its citizens," he says. The smart city is not just for citizens - it is also created by citizens. The SNPO is trying to get people and companies involved. More government data has been made available to app developers, and spaces have been set aside for researchers to test ideas. It is important that the responsive city should not be a top-down creation, experts say, because much of the data powering it will come from citizens themselves. Prof Schmitt points out that compared to centrally installed sensors, there are many more "human-carried sensors": smartphones. Information such as GPS data from cars is also invaluable for tracking traffic. Yet there is a difference between volunteered data and "data taken from you without you knowing". If citizens feel they are being controlled or watched, the smart city will not be seen as a force for good. "We should work with people to see what are the most important things they want to have or that they want to become smarter in their city," he says. Citizens must be happy to be part of the smart city, he says, so they will provide data that the city can do something good with - for citizens, and with them.